As to knowing if people have responded, it looks like you just have to remember to check the thread you posted. I don't see any email notification in place, but then I might be overlooking it, as well. No "like" feature, either. I suppose that's what Facebook is for. Providing a forever home for Skeeter, an 11-year-old male red bellied. On the homepage click "View active topics" under the Parrot Wizard banner. You will see all recently replied to topics and the ones you're involved in will have a yellow circle. Michael wrote: On the homepage click "View active topics" under the Parrot Wizard banner. You will see all recently replied to topics and the ones you're involved in will have a yellow circle. I never noticed that . Meh . Last edited by GreenWing on Wed Feb 12, 2014 4:36 pm, edited 1 time in total. I'm new here & trying to set up my avatar but I'm having the most difficult time. I have windows 7 & I'm using paint. This would be so much easier with photoshop most likely but I unfortunately don't have it on this computer. Post the normal pic here and I can resize it for you if following the original instructions doesn't work. c_faith wrote: I'm new here & trying to set up my avatar but I'm having the most difficult time. I have windows 7 & I'm using paint. This would be so much easier with photoshop most likely but I unfortunately don't have it on this computer. Sounds like you're in the right spots (photoshop/paint) but sometimes it's just easier to use photobucket. 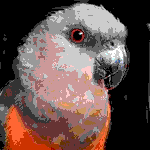 I just changed my avatar by logging in, uploading a photo to photobucket, then going to the photo itself, select DIRECT (link) to copy, and when you log into the Parrot Forum under "User Control Panel" to "Profile" to "Edit Avatar"... paste the direct link in the "off site" option. The dimensions should already be set.